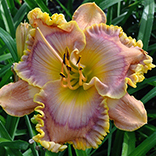 CHARLESTON CHARM (Dan Trimmer) Tetraploid (Sdlg. X Spanish Fiesta) 28" EM. Re. Ev. 4 5/8" (Sdlg. 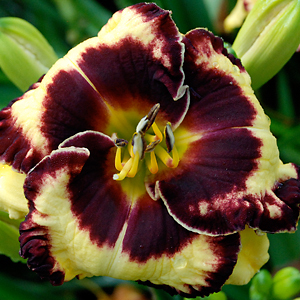 # 8-453) This excellent garden subject is nearly perfect in it's growth habit, garden presentation. and vigor. For the past several years I've tried for larger and larger blooms, but could not leave this bit of perfection behind. Fertile both ways, three branches, a terminal Y produces about 25 buds per scape. Rebloom is immediate.